What a year 2017 has been! Now entering it’s 23rd year in business, Copper Face Jacks incredibly remains to be the country’s number one nightclub. We take a look back at some of the best bits of what was an unbelievable year on Harcourt Street. 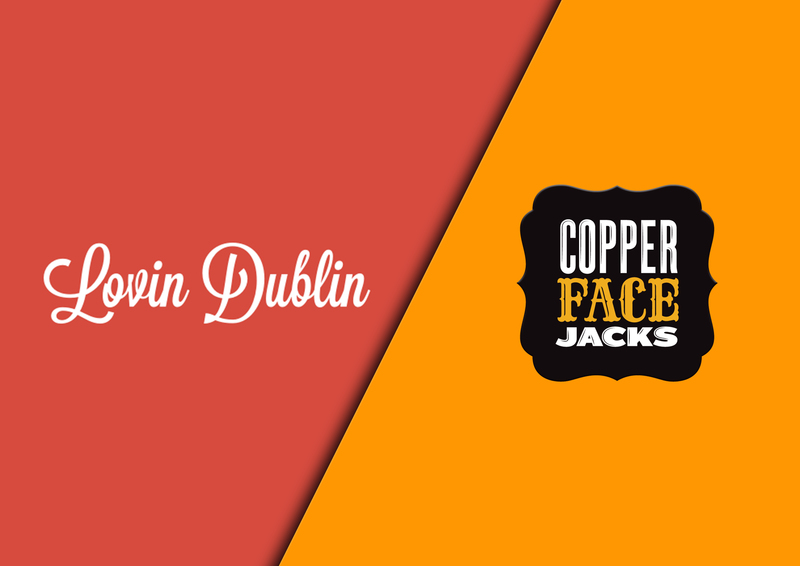 Lovin Dublin has one of the biggest social media followings in the entire country. Every morning, thousands of followers take a look at what Lovin Dublin are up to on their Instagram story. 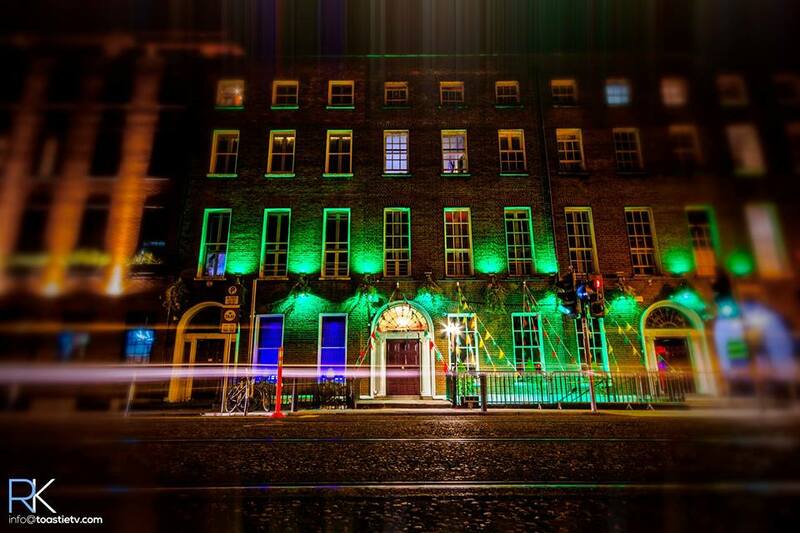 Back in May, followers were treated to a behind the scenes look at the busiest nightclub in Ireland. We gave away a Gold Card for good measure. April was the month, and no it wasn’t exactly an April Fool’s joke either, but Coppers announced that their would be a new resident to keep you all informed. At first, everyone was a little scared, but since then, Jack has been very good to you all. Breaking news from HQ, challenges and random bits of craic. Keep an eye out for it again in 2018. 8. Nurses go free for International nurses night. 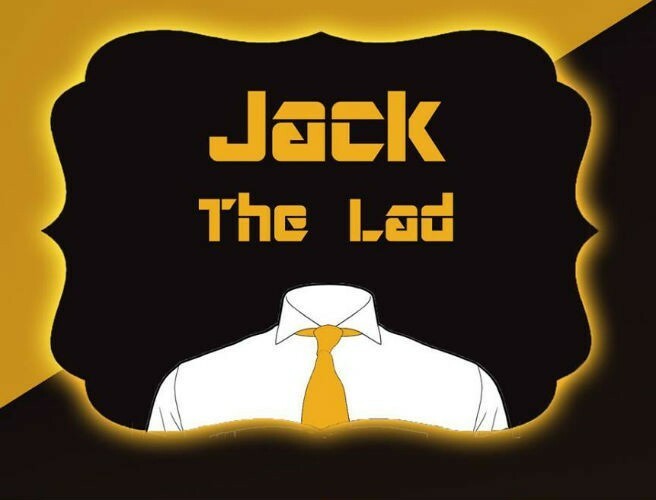 This was one of Jack’s brighter ideas. 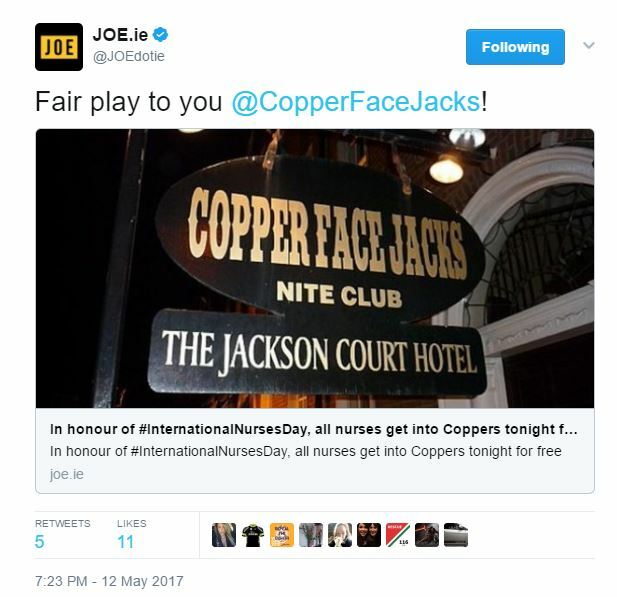 It was announced on Jack The Lad’s blog that all nurses in the country could go free for International Nurses Day, which just so happened to fall on Friday! Coppers was the safest place in Dublin that night. The roof was nearly lifted off the place when the DJ roared, ‘Shoutout to all the nurses in the house tonight’. What a year it was for the Derryman. He really stood up to the cause for the boys in green when needed most. 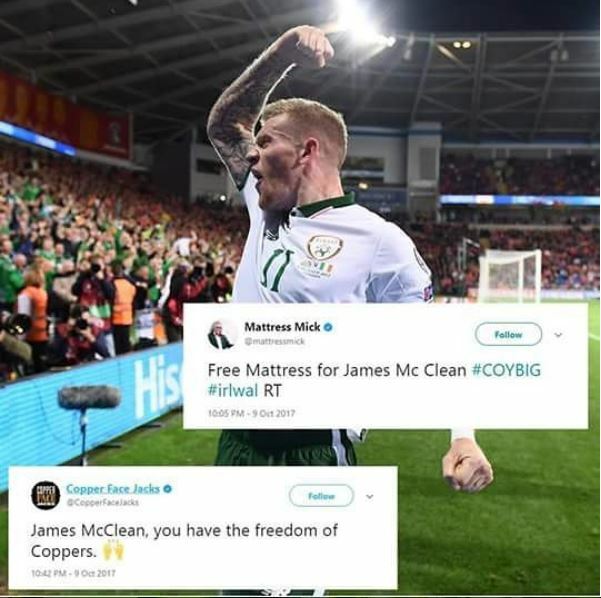 One of the moments of the year, back in October, McClean stuck the ball in the Wales onion bag and kept our World Cup hopes alive. We got a bit giddy and offered McClean the freedom of Coppers, an offer which still remains, we might add. Good aul Matress Mick even threw in a matress. Over four thousand people agreed. Everybody’s favorite comedy duo had a hankering for one of our world famous Gold Cards, but they knew that they don’t come by very easily. They wrote a brilliant and admittedly very catchy song about Coppers, in which they begged for a Gold Card. The video went viral. And yes, they got their Gold Card! Give it a listen there! Who said romance was dead, eh? RTE producer Stefanie Preissner penned an open letter to Copper Face Jacks, never dreaming of getting a reply. Much to her surprise, she got one. She even described it as ‘the highlight of her career’. You can read it below. September weekends in general. 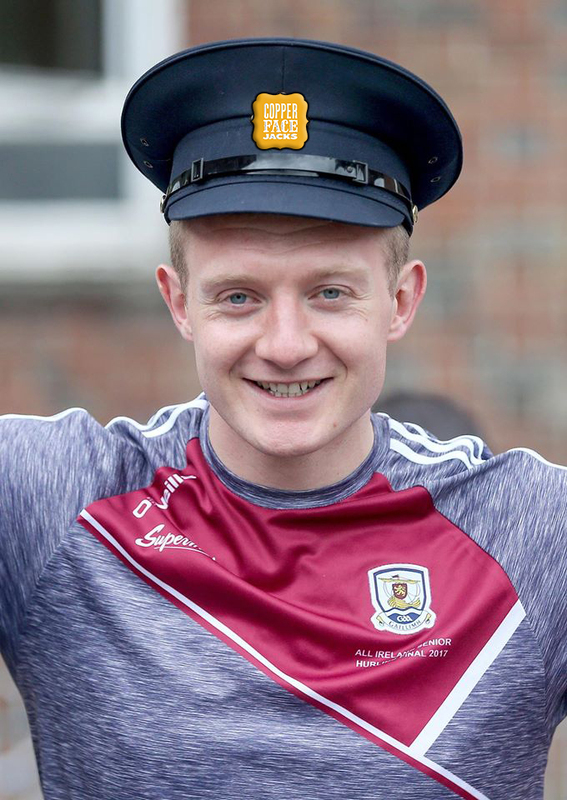 Coppers on an All Ireland Final day has long became a formality. It’s as certain at this stage as death and taxes as they say. This year was one of the more memorable in years gone by. Over the years, a Dublin/Mayo final has proven to be the best date on the Irish calendar. A Dublin men and ladies double meant that Coppers was blue again this year. A novel pairing of Galway and Waterford made for one of the most anticipated hurling final in years. Anyone who was around for either of the finals in any code will agree that it’s probably the best night you’ll have all year. 3. 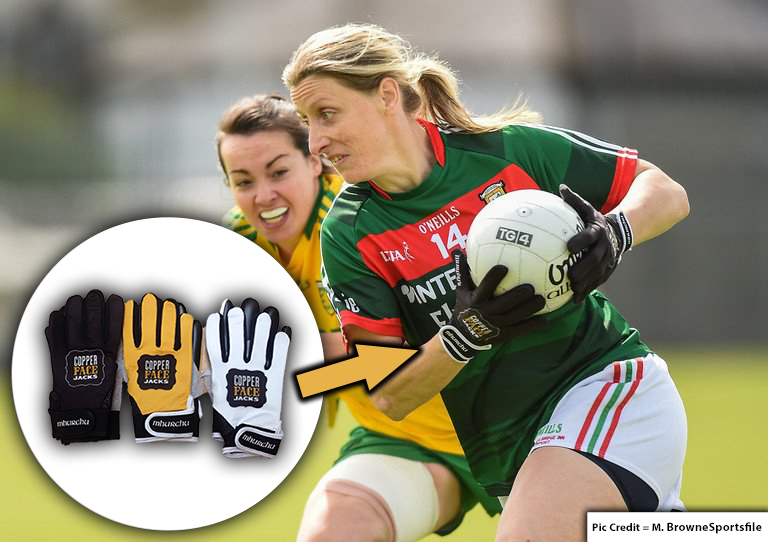 Cora Staunton wears Coppers gloves in an All Ireland Final. Low and behold, someone had the almost comical idea of making Copper Face Jacks branded gloves. They were sent around the country for a bit of a laugh, and that was that. Or at least that’s what we thought anyway. Stepping out on the Croke Park soil, none other than the best ladies footballer of all time, Cora Staunton sporting the famous CFJ logo on her gloves. What a legend! Back in Easter, possibly the biggest music star in the entire world, Mr. Ed Sheeran was touring Ireland. 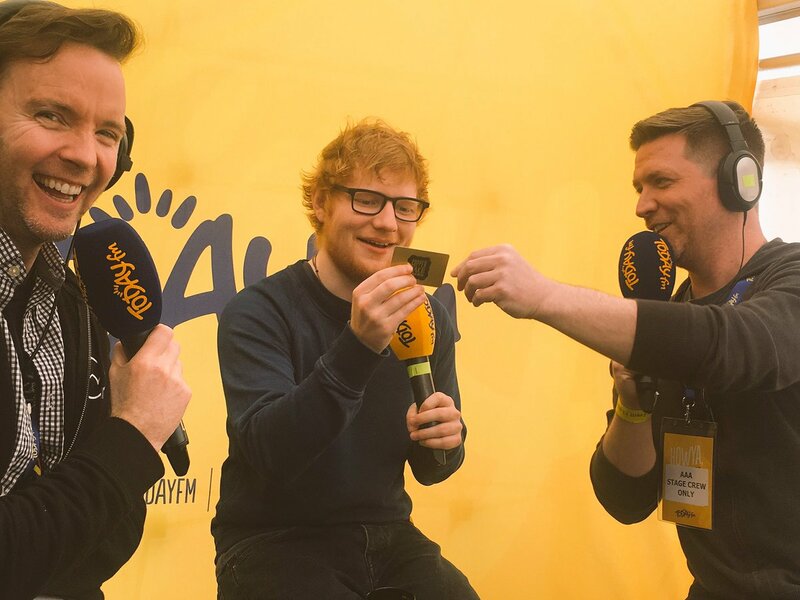 When in Dublin, Ed was taking part in some radio interviews with Today FM when he was presented with an unexpected gift. One of the most sought after pieces of Irish folklore, a Copper Face Jacks Gold Card. If this isn’t the moment of the year, then it certainly is the picture of the the year. 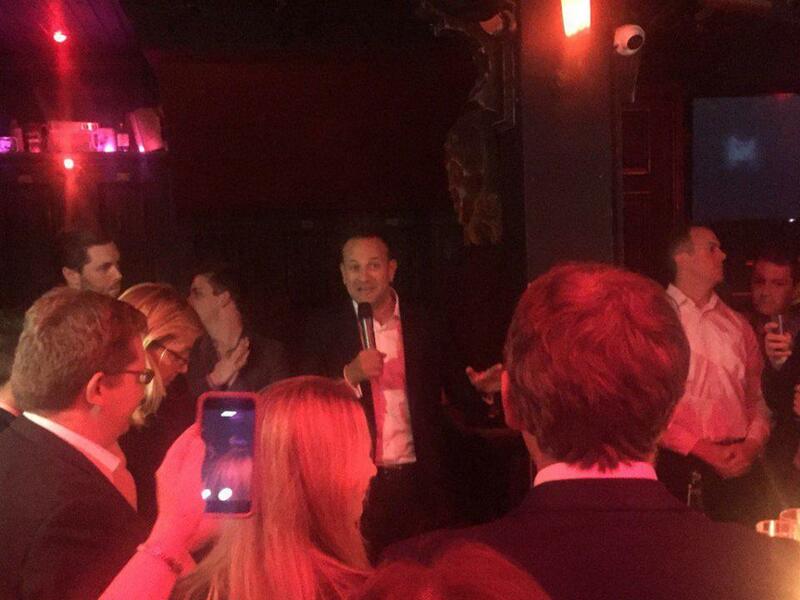 In what was a much unpublicized event, lest we forget that upon being sworn in as leader of our Country, one of Leo Varadkar’s first actions as Taoiseach was to head to Coppers! You couldn’t make it up really. If anything, Leo proved that Coppers is for EVERYONE. You’d just never know who you could bump into in Coppers! Join our mailing list and receive all our special offers, competitions and birthday rewards from Coppers. Drop your details below.